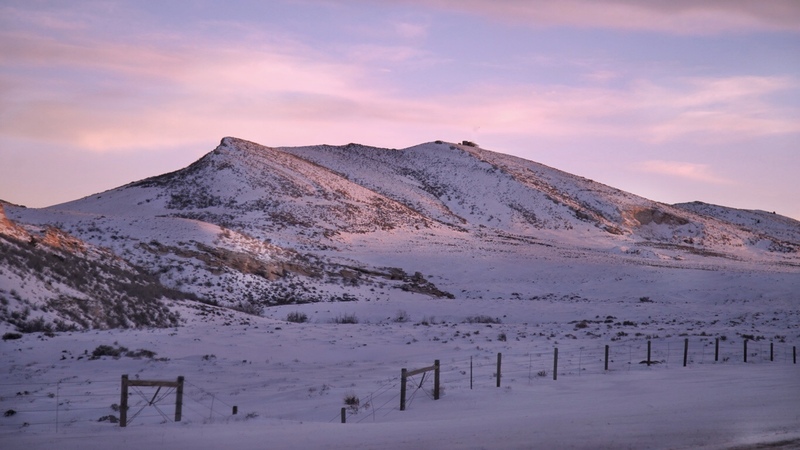 Take the vast, open prairie of South Dakota, and remove the cows and farms, add some bunch grasses, sage brush, and pockets of stunted juniper, along with a few rolling hills, and you have Eastern Wyoming. 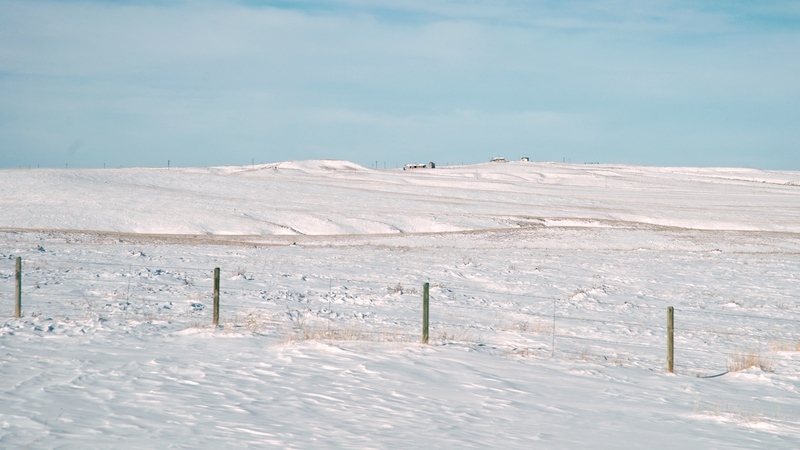 Snow makes this landscape completely homogeneous. There’s a tiny house/farm in the distance. There is a lot of open space here, miles and miles of monotonous sameness. Oh look, a mountain ridge in the view adds a little variety to the landscape. 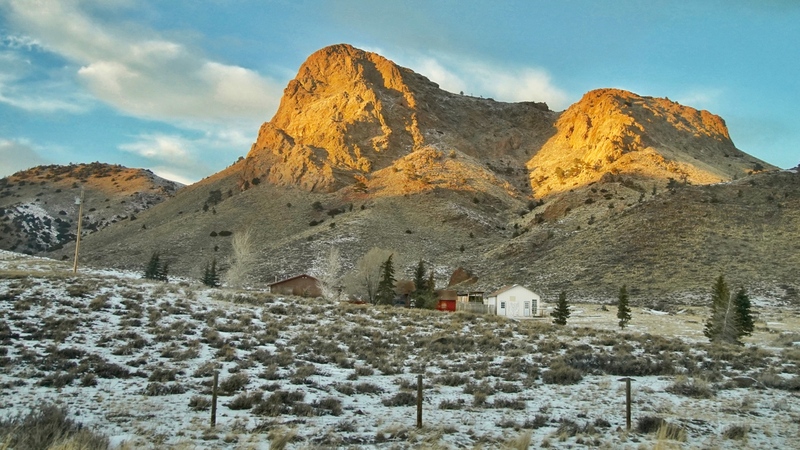 Somehow on our way from I-90 to I-80 in eastern Wyoming, we got off the beaten track and stumbled across a road through a picturesque canyon right before sunset. One of those construction signs with lighted messages warned us, “wildlife next 10 miles”. This was quite exciting because we had seen a total of exactly one hawk the entire day. 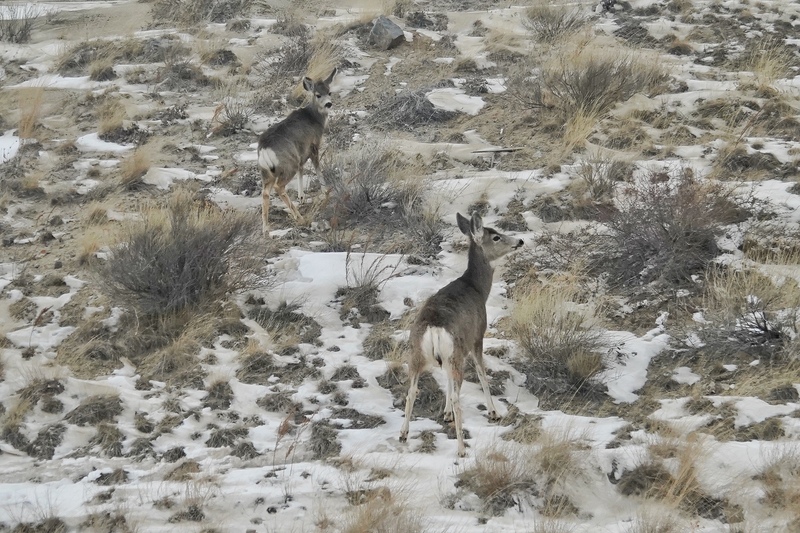 Sure enough around one corner, there were three mule deer standing next to the road, but they quickly scurried away. Two mule deer does just as surprised to see us as we were to see them. 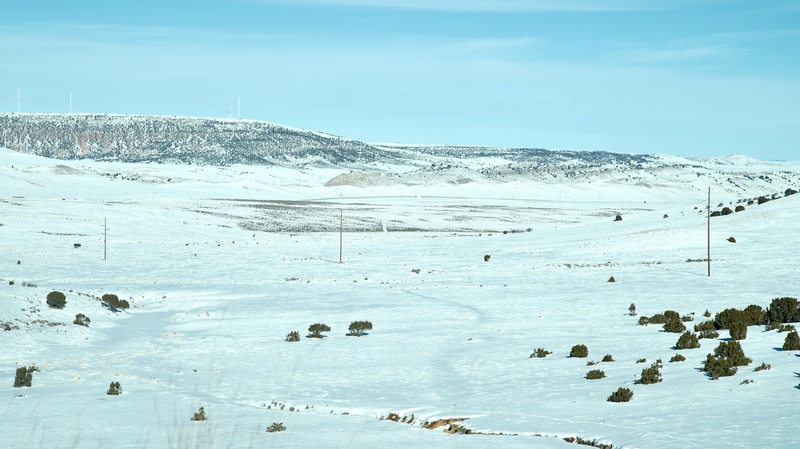 We spotted a raven or two as we drove along the smaller roads, but the winter landscape in this part of Wyoming seems devoid of wildlife: few hawks, no coyotes, no antelope, no jack rabbits, no cattle, no people. It might as well be the Gobi desert. In the twilight we negotiated our way back to I-80 and were treated with a glorious sunset. 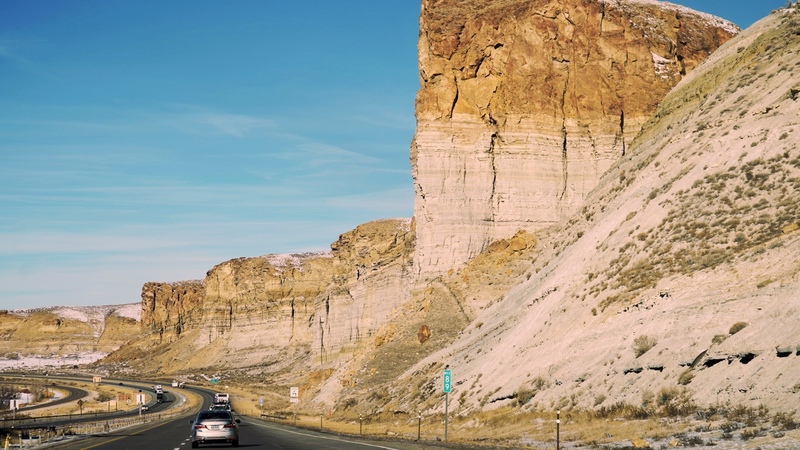 The next day, following I-80 west from Rawlings to Evanston and then into Utah, the Wyoming landscape got more and more interesting, as rolling hills of sagebrush gave way to rocky cliffs, deep canyons, and taller juniper interspersed with a few pines. But the sparseness of human settlement did not change. This is land for the very rugged, independent, individualists of us, who really enjoy their alone time. 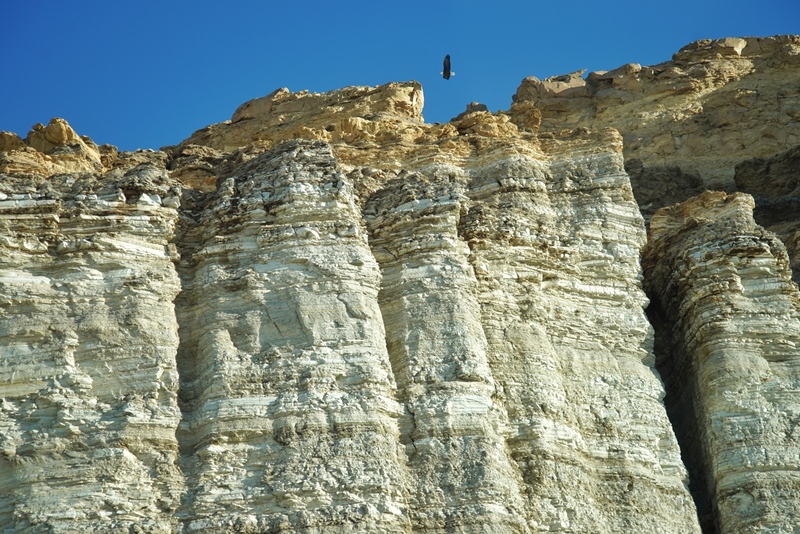 Flying over the cliffs near Green River, a Bald Eagle glided slowly toward the river. That was one of 4 raptors we saw that day. 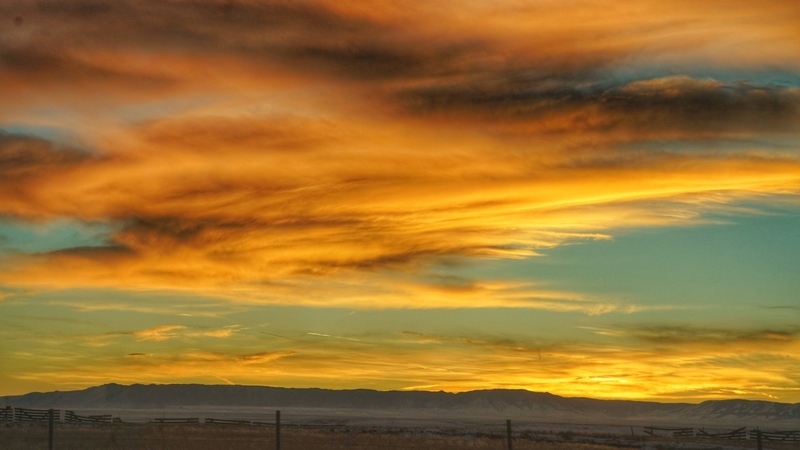 Wyoming is challenging, and mystifying, and interesting, and welcoming. 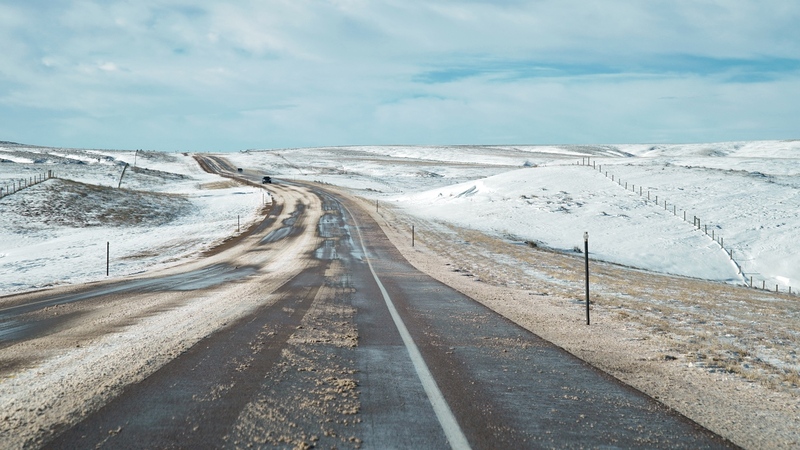 Towns have unusual names like Winner (where you introduce yourself by saying you’re a Winner-ite), Chugwater (how do you suppose it got that name? ), and Guernsey (are there actual cows there?). Friendly hotel and restaurant personnel provide wonderful service, with nary a country twang in their speech. And I bet they are strong enough to throw a hay bale up on a pickup! Mid-summer, it’s the time when fruits are ripening, profusions of flowers light up backyards and prairies, and we see lots of birds, butterflies, and bees everywhere. It might be hot and sticky, but this is the time we’ve been thinking about on those cold winter days. 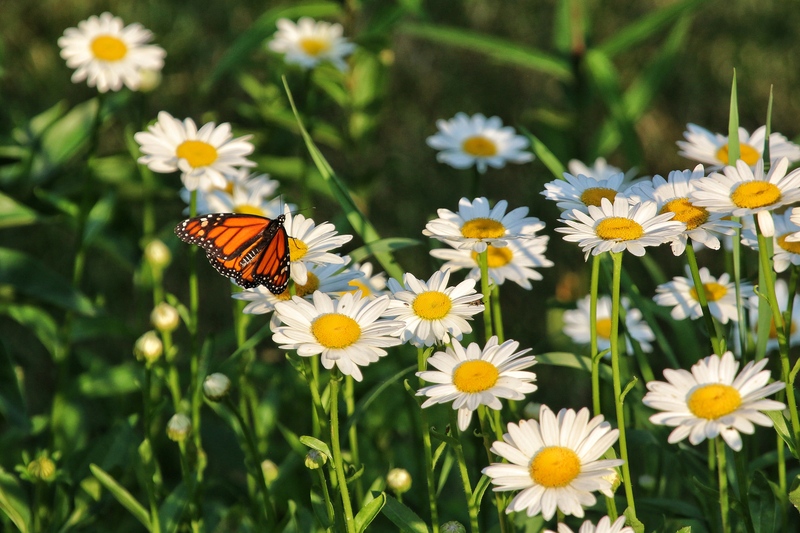 Monarchs have made it to Minnesota by July, and begin laying the generation of butterflies that may be the ones to migrate south in a couple of months. Lake water warms up, and mats of water lilies and duck weed clog the shorelines. 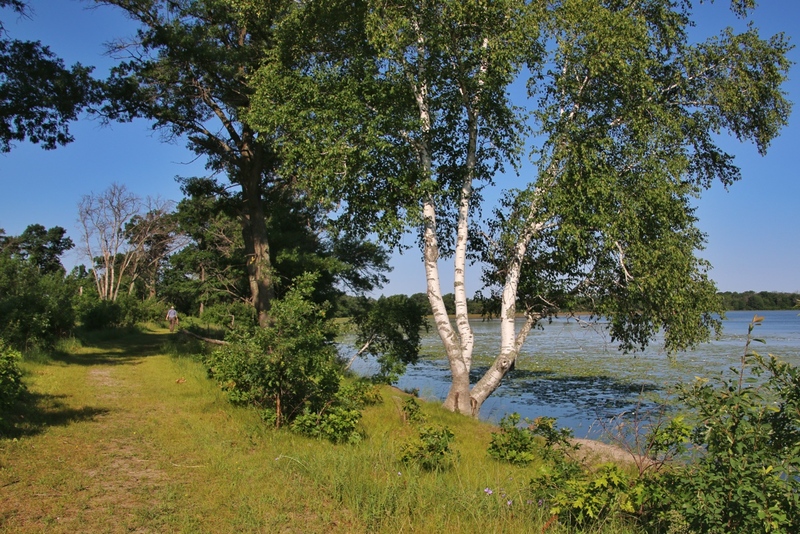 Warm summer days, scenic Minnesota lakes, one of the more than 10,000. 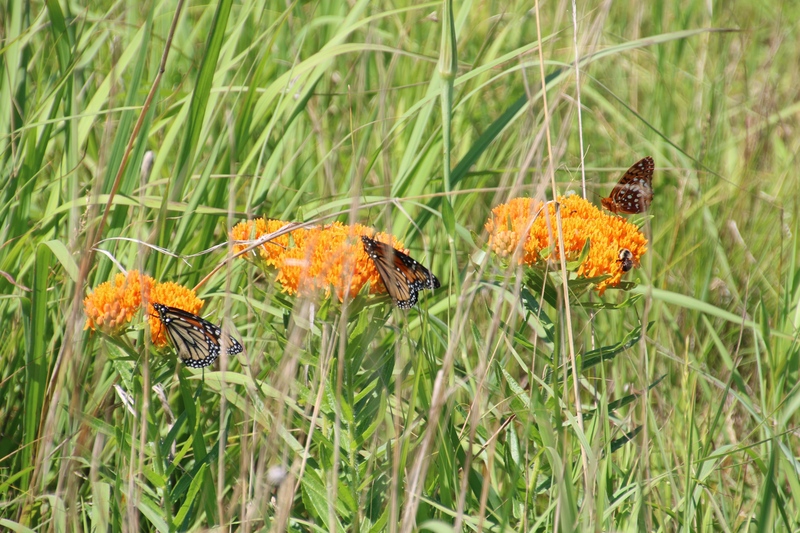 Butterfly milkweed is in full bloom, attracting butterflies and bees. 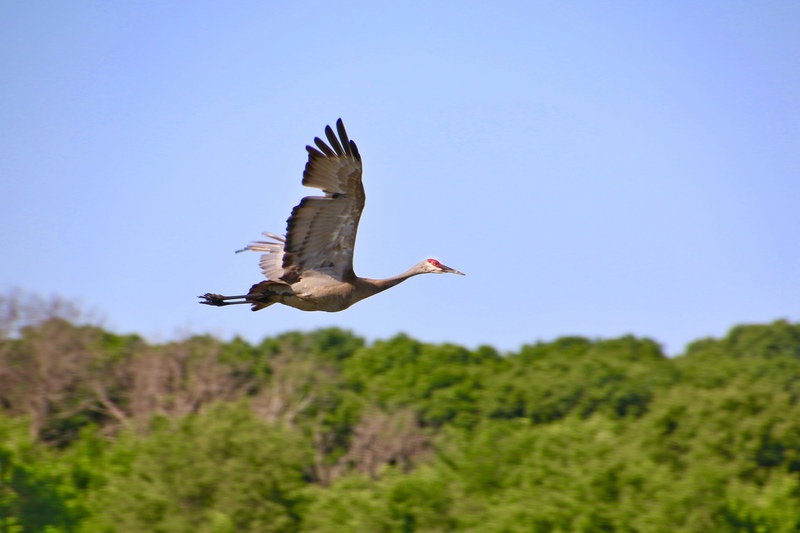 Sandhill Cranes may have chicks following them around through the prairie meadows, and occasionally you see and hear them fly overhead. 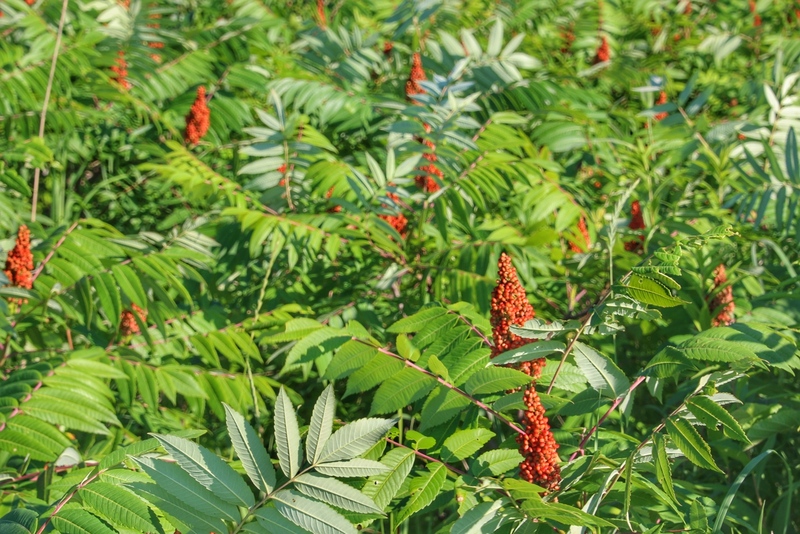 Fruiting heads of smooth sumac light up the green forest of sumac shrubs. Did you know that the seed heads are high in vitamin C? Crush them in water to make sumac-ade! 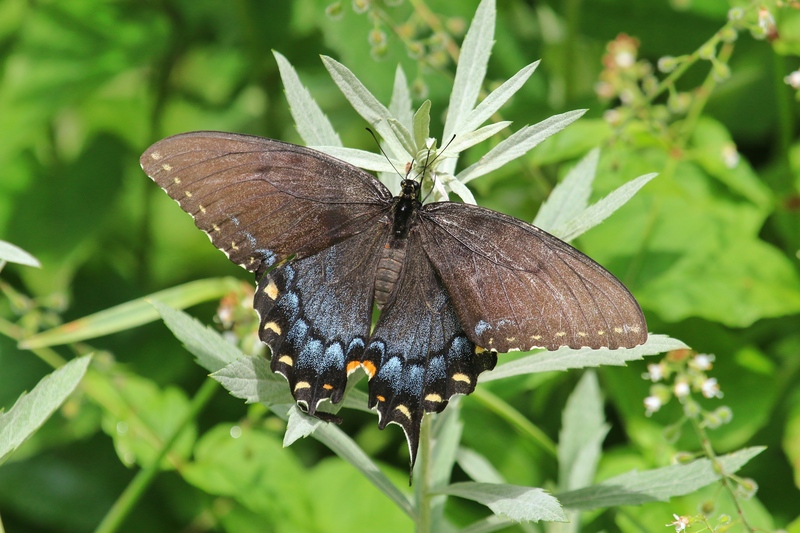 The black morph of the Tiger Swallowtail butterfly has been visiting the backyard garden this week. It must be relatively newly emerged, with no bites in its wings yet. What’s not to love about mid-summer days in the Minnesota backyard? Springtime in Iceland is a mecca for bird photographers, as arctic breeding species return to find a mate, build a nest, and perpetuate their species. The road next to our river hotel in Hella is particularly rich with Snipe, Black-tailed Godwit, Whimbrel, Oystercatchers, and Golden Plover. The bird fauna here is dominated by shorebirds, with few representatives of other orders, like the songbirds (passerines). Snipe stand on hummocks of grass or even on fence posts, chirping their monotonous two tone beeps, then take off flying overhead in a display flight, complete with tail feather whirring noises. They are so common here, we see one about every 50 feet. Black-tailed Godwits use that long slender bill to probe for insects and worms in the soil in these fields, but can also be found on inland marshes and estuaries in the U.K., on migration. Whimbrels are common in the fields, too, sometimes in small flocks, sometimes alone, hunting for the same worms and soil insects. We’ve only seen Redshank along sandbanks and coastal shores in the U.K., but here they are commonly found in grassy fields. Redwings are the dominant thrush in Iceland. We see them everywhere, in the fields, in the brush near water, in small trees, lustily singing their warbling thrush melody. Golden Plovers are solitary in these fields, but are seen fairly often. Meadow Pipits seem to be the one of the few small passerine birds around. There are no small finches or small insectivores, like warblers or titmice, probably because there is limited food for those types of feeders. Fence posts are popular perches in this flat, monotonous grass landscape. Pipits seem to get by in this sparse landscape by eating tiny insects as well as seeds of a variety of plants. The friendly little White Wagtail is another common passerine that breeds in far northern latitudes. It is a widespread species in the summer throughout Europe and Asia but migrates to warmer overwintering sites as far south as Northern Africa. They feed on a variety of small aquatic and grassland insects, flitting and darting around as they track their prey. The best way to see the forest and prairie scenery in Bielowieza is to grab bikes and tour the countryside. Many roads to some of the small villages are less traveled by car and perfect for birding bikers. Here are a few of the things we saw. Prairie near Bielowieza, patch of a kind of thistle ? Wild Eurasian horse, similar to the extinct tarpan, at the bison reserve. Tarpan went extinct in the early 1900s, but breeding experiments attempt to restore this ancient horse lineage. Tiny Roe deer fawn is dwarfed by the tall grass in its pen at the bison reserve near Bielowieza. The Wisent, or European bison, is a look-alike of the American bison, but its genetics tell a different story. Wisent, European forest bison, is really a grassland animal that takes refuge in the forest. As the story goes, once upon a time between ice ages, steppe bison wandered the grasslands of Europe, Asia, and North America, traversing the Bering land bridge during glaciated times. Cut off from Asia when sea levels rose, the steppe bison in North America underwent moderate changes to become the buffalo we recognize today, but then suffered huge declines in numbers when railroads through the central plains brought hunters that killed off huge numbers of them. The steppe bison was also hunted extensively, and may have gone extinct from overhunting about 11,000 years ago. But aurochs (European progenitor of cattle) and Steppe bison matings in Europe produced hybrids (now known as Wisent) that survived the hunting pressure, perhaps by retreating deep into the primeval forest. Wisent numbers also declined precipitously with settlement and expansion of agriculture in Europe, but a few remained in the small forest fragments, like the one near Bielowieza. Hybrids usually are less fit than their ancestors, largely because they are less fertile (e.g., mules), but in the case of the European bison hybrid, they appear to have survived both hunting pressure and the extreme cold of the interglacial periods better than their steppe bison ancestors, and retreated to the forest for protection. The Bison reserve near Bielowieza has expansive enclosures for its animals, and lots of natural prairie grass for forage. Captive breeding of Wisent at the Bison reserve just outside Bielowieza attempts to track genetic ancestry and propagate animals that could be released to the wild, but wild Wisent exist in small herds through the forest-grassland spaces in eastern Poland. They are mighty hard to spot — judging from our early morning explorations of the area. The Bielowieza forest is surrounded on the Polish side by farmland, much of which is hayed for dairy cattle. Polish farmers seem to prefer haying their meadows of grasses and forbs, rather than planting monocultures of alfalfa. 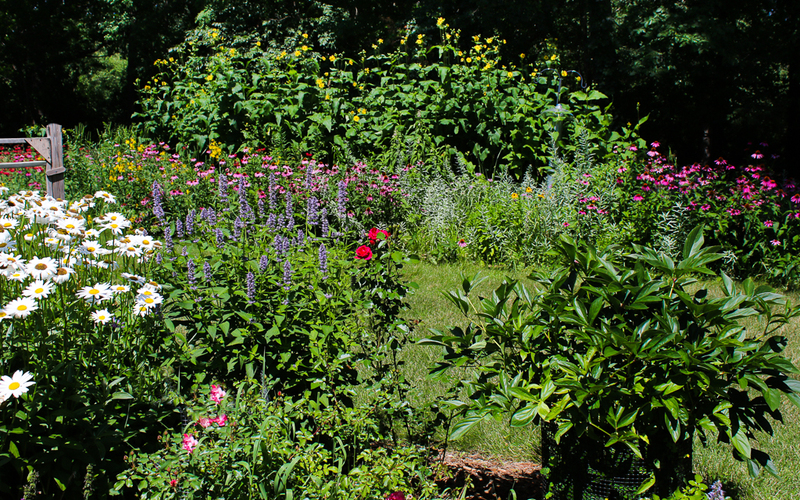 As a result, forest visitors (the human variety) are treated to a colorful scene of perennial blooms, very similar to that we see in Minnesota prairies, only with a lot more color. We were amazed to find a number of the same species present in Polish prairies as we might find along roadsides in the U.S. Of course we call these weeds, and perhaps they are in Poland, too. Or perhaps they really are part of the natural prairie mixture. And the mode of travel through prairies is different too. We don’t have any of these nifty wagons in the U.S., unfortunately. Two words that are usually said together: bird song, or better yet songbirds, those usually small birds in your garden that produce the wonderful, lilting, sometimes piercing, often warbling, unique collection of notes that identifies each species. But not all songbirds sing, or sing exclusively — some of them have adopted a buzz as part or all of their song. In fact, their soft buzzes or wheezes are remarkably similar and difficult to pinpoint when looking for that buzzing bird that you’re not really sure isn’t some sort of insect. Why would male birds want to buzz instead of sing? Take the Blue-winged Warbler for example; wouldn’t you assume from its name that its song would be a melodious warble, rather than a two-note “bee-buzz“? A beautiful Blue-winged Warbler sitting out on the edge of the forest overlooking a prairie grassland, buzzing away. A better look at the blue wing of the Blue-winged Warbler. He was little and mighty far away. Just 20 feet away, a Clay-colored Sparrow is buzzing away, with a very similar, low frequency, raspy buzz call. Pale-colored, but with distinctive stripes on its head and face, the Clay-colored Sparrow blends in well to its usual background of dry grass. Its pink bill resembles that of a Field Sparrow, but its buzzing “song” makes it easy to identify. Buzzing seems to be a common characteristic of “song” in grassland birds, like Grasshopper Sparrows and Savannah Sparrows. So, one wonders if these birds are trying to avoid detection in prairie habitat by mimicking insects when they “sing”, or whether female birds just find buzzing particularly enticing? It turns out that buzzing sound made with the bird equivalent of a larynx (called a syrinx), is actually quite physically challenging, and therefore could be an indicator to females of the quality of a potential mate. German researchers* found that larger, more robust male Nightingales incorporated more buzzes in their song, and enjoyed greater attention from females than their less robust or younger competitors. Tromping around Weaver Dunes, south of Wabasha MN, for 8 hours trying to identify every bird we could find was exhausting but rewarding, and what an absolutely beautiful day to participate in The Nature Conservancy’s bird blitz on May 12. The spring migration was running a little behind schedule, but we managed to find (and identify) 58 species (which admittedly doesn’t sound like a lot for 8 hours of work). We explored a variety of habitats, but the best places to look were edges between shrub and forest, or prairie and forest. Yellow-rumped Warblers outnumbered other warbler species, and thankfully posed at much lower elevations in the trees. We only saw one Rose-breasted Grosbeak, and he was quite shy about coming out in the open to show off his raspberry bib. Lark Sparrows were more common than the warblers, flashing their white outer tail feathers as they flew. True to their name, their song is much more of a warble than a buzz — i.e., lark-like. Lark Sparrows typically nest in shrubs and forage in grassy areas removed from the nest. They have the unusual habit of walking, instead of hopping. Down at the edge of a small pond, a Northern Waterthrush hunted for insects. A distinctive eyestripe and wagging tail made this large warbler easy to identify. A Brown Thasher was very uncooperative about posing, and remained hidden in the dense foliage of trees in the grassy savannah. Orioles foraged high in leafy treetops, but were easy to find by listening for their characteristic song. Another edge-lover found skulking among the low vegetation in the woods surrounding a pond was the Gray-cheeked Thrush, with its characteristic white eyering. Our efforts were added to those of the birders walking other TNC properties throughout the tri-state region of MN, North Dakota, and South Dakota. Together all observers on May 12 found over 200 different bird species, or approximately 50% of those known to reside or pass through MN on migration in May. Not bad…it’s a nationwide competition, so we’ll see how MN bird numbers stack up with those elsewhere in the U.S. Considering that our American birds have to navigate and survive stormy weather and drastic climate changes, glass windows and glass-covered buildings, marked habitat alterations, and depleted food supplies from all the pesticide and herbicide applications, it’s a wonder that we see the diversity that we do. Not all plants are as sensitive to the daylength and temperature cues — making the fall season a long and colorful display. Maples and aspens are some of the first to show their fall colors, and oaks are one of the last, making the forest a kaleidoscope of green, yellow, red, and orange. A few remaining flowers like this New England Aster can still be found in the prairie, but there are few insects around. Milkweed pods open to disperse their airborne seeds. Yellow-rumped Warblers are one of the more abundant migrant species, found and heard in almost every habitat — even the prairie. Waves of warblers (like this Nashville Warbler) move through with the weather fronts in the fall. But these are wary little birds, and even harder to photograph in the fall when they are feeding ravenously to replenish their migratory fat supply than they were back in the spring when they came through on their way north. We spent the weekend in central Minnesota taking photos of different stages of prairie restoration. Prairie grasses are above knee high already, and there are quite a few perennial forbs flowering — injecting some highlights of color into that huge expanse of green. Tall stems of timothy grass stand behind the lower herbaceous perennials on the Lake Johanna Esker prairie. Many thousands of years of growth of perennial prairie grasses in this area resulted in a several feet thick layer of black, organic-rich soil — perfect for farming. But as a result, less than 2% of the original 19 million acres of native prairie remain. Any prairie that could be plowed (not too dry or wet, not too steep or rocky) was converted to cropland over a hundred years ago. But here, pasture (on the right) is being returned to a prairie, while the hill in the background (too steep to plow) has been heavily grazed. In the absence of fire or heavy grazing pressure, prairies are easily invaded by trees. Where there are large acreages of prairie or grassland landscape, we can usually find some of the native prairie animals and plants that live there. What a treat to drive down one gravel road that dead-ended in a soybean field and find a family of Sandhill Cranes walking through the meadow grasses. This pair of Sandhill Cranes tried to distract us from finding their two chicks by walking up the hill away from where the chicks hid in the longer grass. One of the chicks was a little less than half the height of the adults — with no tail yet. I suppose they thought we might follow them up and over the hill, but as we backed away, they flew back toward the chicks.